Samsung has developed its first Android Go smartphone which the company is likely going to launch soon. We exclusively reported a couple of weeks ago that Samsung is testing this device bearing model number SM-J260G in dozens of markets across the globe including the United Kingdom, France, Russia and India. 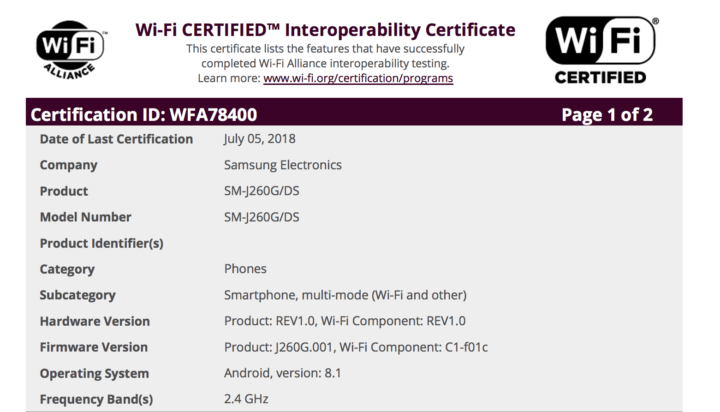 The Samsung Android Go smartphone has now been listed at the Wi-Fi Alliance where it has been certified with Android 8.1 onboard. Such certifications are always taken as an indication of an impending launch. This certification thus suggests that it may not be long now before the first Samsung Android Go smartphone is officially launched. We exclusively leaked several images of the Samsung Android Go smartphone two days ago. The images confirm that contrary to reports, Samsung’s first Android Go device won’t be running stock Android. The handset will merely have the Go versions of Google’s official apps installed while the Samsung Experience skin will be very much there. To be clear, Google has never said that Android Go devices will offer a stock Android experience. The Android Go initiative only promises an improved user experience on cheap Android devices with 1GB of RAM or less with apps that require less memory and storage space. The images that we leaked also revealed that this device will be running Android 8.1 Oreo at launch which has been reiterated today by the certification. As far as the specs ago, the handset may feature a 1.4GHz quad-core processor with 1GB of RAM and 16GB of storage. It may also have an 8-megapixel rear and 5-megapixel front camera with a 2,600mAh battery. No word as yet on when Samsung is planning to launch its first Android Go smartphone, the markets where it’s going to be made available and how much it’s going to cost. Reports suggest that this device will be branded as the Galaxy J2 Core at launch but there’s no confirmation of that just yet.